With the imminent move of a number of BBC programme-making departments from London to Salford Radio 4’s The Long View today took a look at another controversial move of a major media institution that happened 50 years ago – that of the Guardian newspaper from Manchester to London. One of the key figures in the move was the paper’s editor Alastair Hetherington. In later years Hetherington was Professor of Media Studies at the University of Stirling and the archives holds a collection of his personal papers. Hetherington was editor of the Guardian during some of the major events in the newspaper’s history including its criticism of the British government’s handling of the Suez crisis (1956), the dropping of ‘Manchester’ from the newspaper’s title (1956), moving the printing of the newspaper (1961) and its editorial offices (1964) to London. 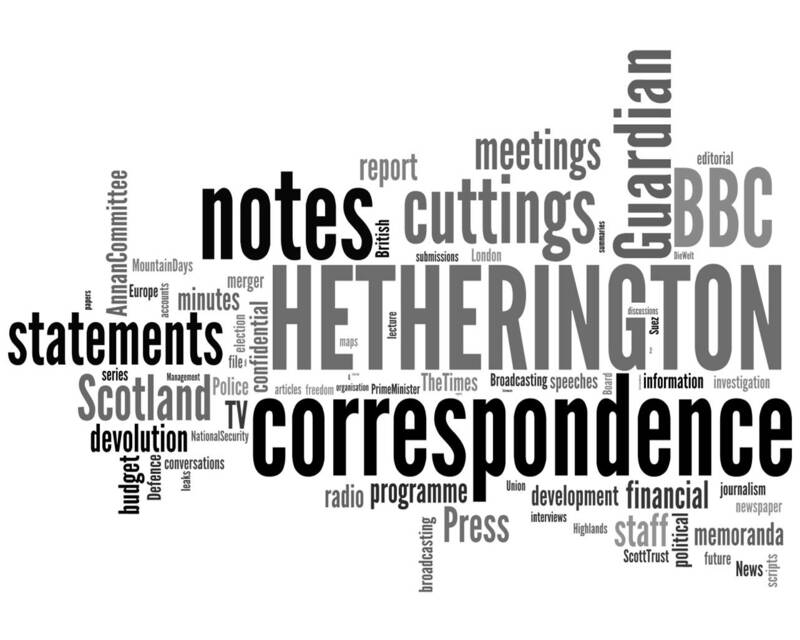 The papers held in the university archives cover Hetherington’s time at the Guardian as well as his early years as a young journalist in post-war Berlin and at the Glasgow Herald, and his later career at BBC Scotland. Wordle image for the Hetherington collection.